I came late to the Radiohead party. I think my invite was lost in the post. The buffet had been demolished, the DJ was playing the slowies and desperate singletons sat sobbing at their ability to scare off any potential mate. Probably a good thing really. There are a number of Radiohead tracks that I like, but I think by the time I had got into Radiohead, the days of listening to albums in their entirety had long passed. So, in an effort to discover more hidden gems, I obtained a copy of their Best of . 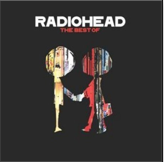 All but one of my favourite Radiohead songs appear in this compilation. That one would be released on a much later album. But this album/compilation is a good showcase. Not my cup of tea mind. But enough to convince me that I need not worry about obtaining their back catalogue.